Tsukasa Taiko is a program of Asian Improv aRts Midwest, offers taiko drum instruction, education, and performances. Tsukasa Taiko’s mission is to preserve, develop, and pass on the traditional concepts of Japanese art as a cultural legacy, to instill an appreciation for artistic excellence, and to utilize these concepts in expanding and evolving the taiko art form. As a community group dedicated to understanding and strengthening Japanese American, Asian American, and Japanese identity, it strives to respect tradition and develop artistic excellence and connoisseur-ship. Its director, teachers, and administrative staff are dedicated professionals and all are recognized as world class, working artists. As an active performing group, Tsukasa performs over fifty shows a year, both locally and internationally. Tsukasa Taiko offers classes, workshops, lectures, and demonstrations designed to teach how to play taiko, as well as to advance the understanding of how the cultural arts are a reflection of a community’s heritage and legacy. More information on how to register for classes with Tsukasa Taiko can be found on their website. If you’d like to experience the art of taiko drumming in person, Tsukasa Taiko has numerous performances planned throughout the year in the Chicagoland area. Tsukasa Taiko is led by prolific composer, multi-instrumentalist, educator and performer, Tatsu Aoki. One of the most recorded artists in the Chicago music scene, Aoki works in a wide range of musical genres, from traditional Japanese to jazz to experimental. Born into an artisan family before the downturn of traditional Japanese entertainment, Aoki carries with him the knowledge and self-imposed responsibility of preserving the original essence of that musical genre, while simultaneously expanding the voice of jazz, taiko and other musical forms. Aoki is a recipient of the Chicago Tribune’s “Chicagoan of the Year” award and recognized by Jazziz Magazine as one of the artists who “changed jazz,” among other accolades. For more information, please visit www.taikolegacy.com. In its most common incarnation Taiko (Japanese drum), is typically heard at seasonal festivals and temples all throughout Japan. The more esoteric and theatrical expression of Taiko is a less frequent and more difficult endeavor, but at the core of Tsukasa Taiko’s artistic and musical vernacular. At present, the fifteenth-anniversary performance, features two distinct stops on the MCA Stage, continuing along our 22-year journey. 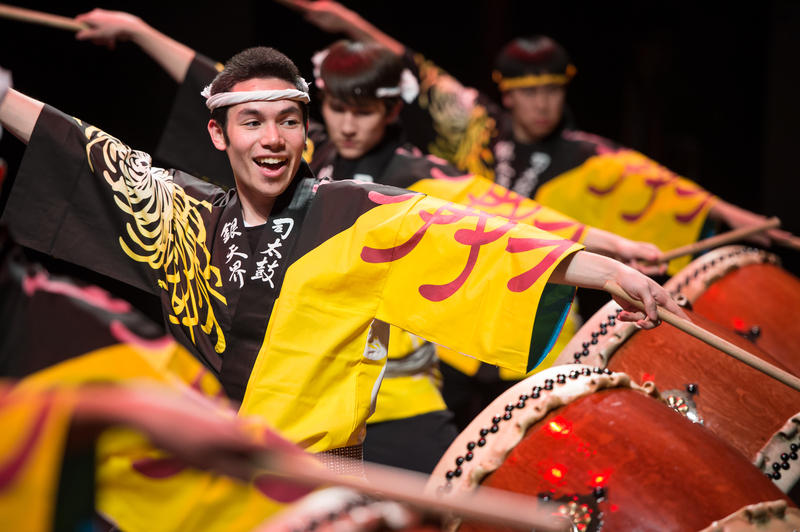 Taiko Legacy is one of the largest Taiko drumming concerts in the Midwest. This perennial presentation reunites professional contemporary and classical performers alongside enduring community members to celebrate over two decades of artist directed performance. The multi-generational ensemble Tsukasa Taiko anchors the traditional musical relationship between Shamisen, dance, and Taiko. 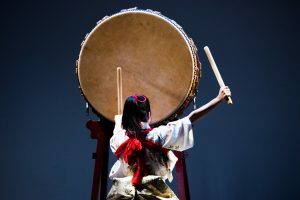 The often overlooked melodic capacity of the Taiko is unattainable without a thorough awareness of the origins and craft of the traditional Japanese music. This ensemble performance explores the concept using original compositions and arrangements rooted in a broad range of musical styles including: Ozashiki(geisha chamber music), Minyo (folk music), Ohayashi (classical/folk/theater music), and Matsuri Taiko (festival taiko music). This year’s featured guests include Melody Takata and the Gen Ryu Arts of San Francisco, classical music grandmasters from Japan, Chizuru Kineya, and Chindonya (traditional troubadour) Yasushi Shimazaki. CHINDONYA is a traditional type of Japanese street musician that advertised for local shops and businesses. The elaborately dressed performers parade through the streets playing music and singing to gather attention for their clients. Nowadays, the Chindonya tradition has become more of a rarity in Japan. Taiko Legacy guest artist, Yasushi Shimazaki will present a special hands-on workshop tracing the origins of Chindonya culture and explaining various instruments and routines, as well the theatrical implications of being a Chindonya in today’s time. Tsukasa Taiko is a program of Asian Improv aRts Midwest and a resident at Japanese American Service Committee of Chicago and is supported in part by the Illinois Arts Council, the MacArthur Fund for Arts & Culture at the Richard H. Driehaus Foundation, the Alphawood Foundation, Corbett, Duncan & Hubly pc, JCCC Foundation, CityArts by City of Chicago Department of Cultural Affairs and Special Events (DCASE) Cultural Grants Program and The Joyce Foundation.